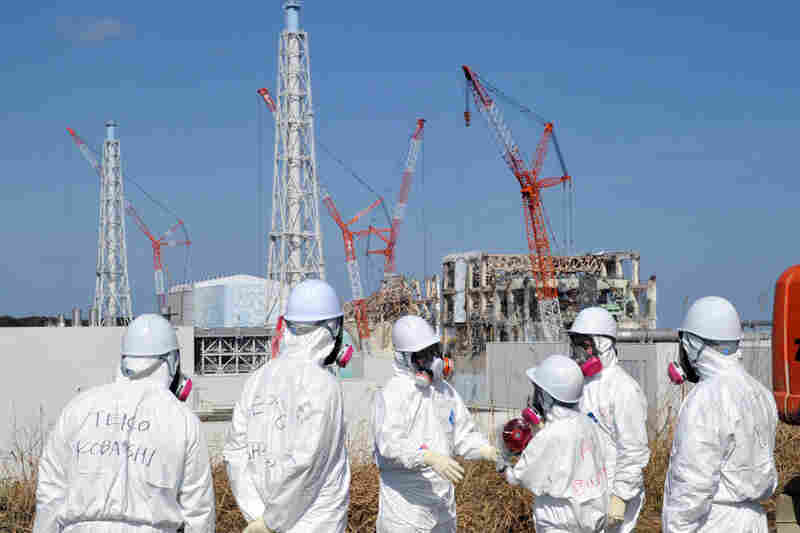 Crippled Japanese Reactors Face Decades Of Work Though the immediate nuclear crisis in Japan has passed, the process of securing and stabilizing the radioactive materials from the melted-down reactors will be a long, expensive slog. Recovery workers will also need to decontaminate the area surrounding the plant. 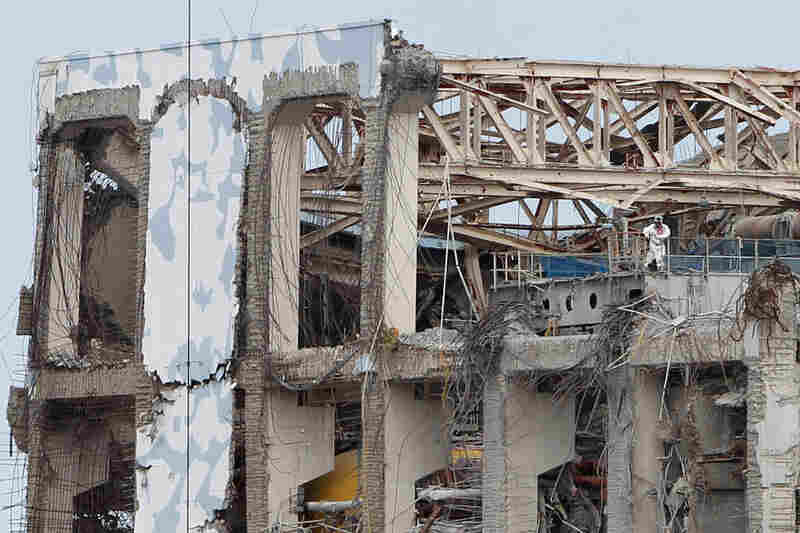 Last year's earthquake and tsunami crippled the Fukushima Dai-ichi nuclear power station. Foreign journalists saw cleanup and recovery work in process on Feb. 28. The reactors are now in a stable "cold shutdown" phase, allowing workers to get closer access to secure the radioactive material. 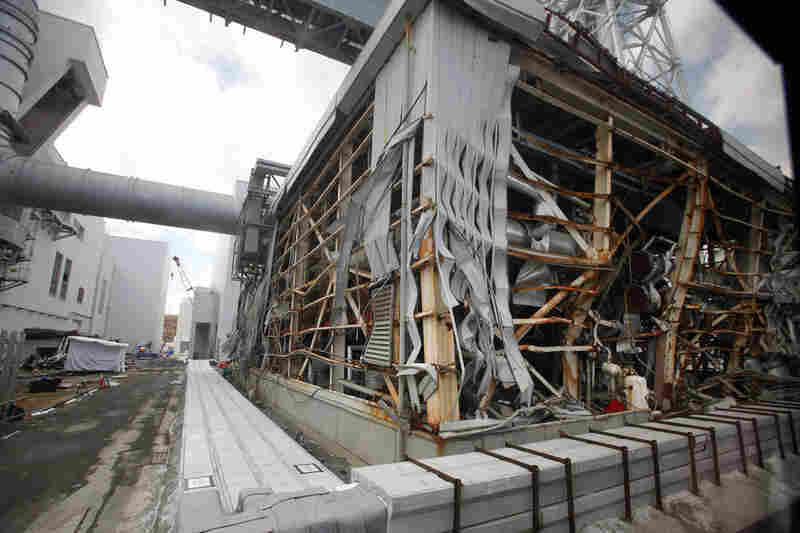 The 45-foot tsunami wave severely damaged the reactor buildings, flooding underground spaces and disabling backup generators. Broken vehicles remain abandoned near a turbine building for months after the water receded. Rubble was virtually untouched before this Nov. 12 photo was taken. 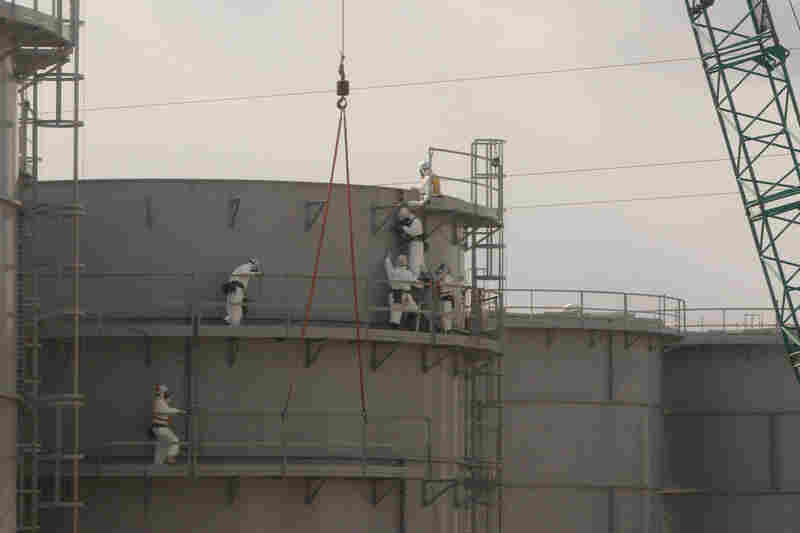 Workers assemble water tanks at the power station on Feb. 20. Engineers plan to flood the reactors, which will give them safe access to the nuclear fuel. 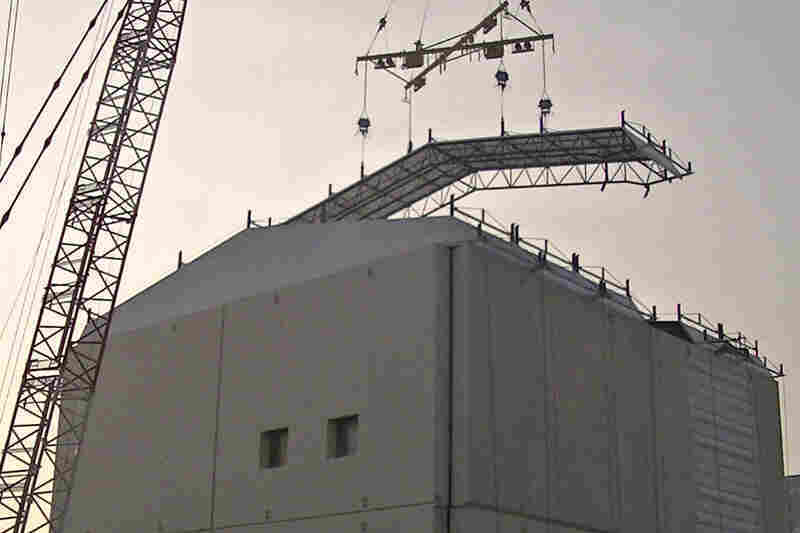 A huge iron tent is constructed over one of the reactor buildings at the facility in October. Cleanup efforts could continue for decades. The earthquake and tsunami that hit Japan on March 11, 2011, lasted for many terrifying minutes. But the multiple nuclear meltdowns that followed created an emergency that lasted for weeks and a legacy that will last for decades. Here's how the event unfolded. 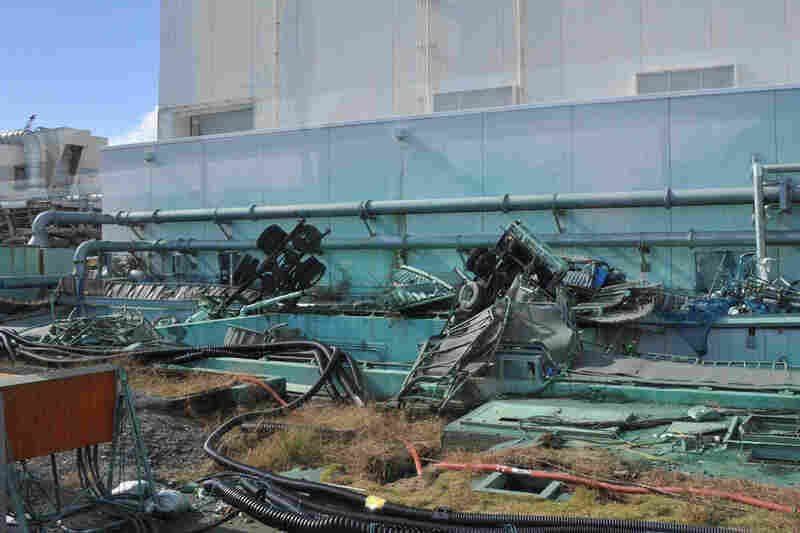 The tsunami knocked out power to the Fukushima Dai-ichi nuclear power plant. As a result, the cooling systems failed and three reactors melted down. Steam laced with radioactive material poured into the air. Water contaminated with radiation also flowed into the sea. The plant still looks like a ruin, but the situation is actually stable. "The risks of further releases from the plant are pretty low, and the main issue going forward is going to be decontamination and ultimately cleaning out and removing the damaged fuel from these reactors," says Per Peterson, chairman of nuclear engineering at University of California, Berkeley. That's more easily said than done. Engineers haven't been able to look into the reactors, but they suspect at least one of the nuclear cores melted through its reactor vessel and now sits on a concrete and steel floor below. It's no longer boiling hot, but it is extremely radioactive. Peterson says one of the biggest challenges will be to seal up the whole system so they can fill it with water. Water will serve as a radiation shield and let workers get close enough to break up and collect the ruined fuel. To close up the leaks in the vessel, "one option would be to inject cement around the outside of the vessel," Peterson says. "And by doing that — it's called grouting — you can essentially fill up and plug all of that space and then you can get the vessels to be watertight." The broader containment buildings are also leaking. Finis Southworth, chief technology officer at Areva North America, says water comes into the reactor basements when it rains. That's a problem. "You want to completely stop that groundwater intrusion to make sure you have no leakage in either direction," Southworth says. That contaminated water is being collected and cleaned in a massive filtering system. It was cobbled together quickly in the months following the accident, and Southworth says they're now upgrading that system by taking out hoses and putting in pipes. And he says the power plant is gradually looking a lot less like a disaster zone. "The progress is stunning," he says, voicing his personal opinion. "The degree to which Japan and TEPCO [the utility company] have been able to clean this site up in under a year is phenomenal." The good news is, TEPCO is keeping on its schedule to clean up the plant — the bad news is that the schedule stretches out for decades and the cost is anybody's guess, but certainly in the tens of billions of dollars. That's a sobering thought for the global nuclear industry, which is hoping to expand. But comparatively, it's not that big a piece of the overall cost of the tsunami disaster. "It's a large impact economically, but given how large the whole event is, it's a small part of it, only a few percent," says Michael Corradini, a professor of engineering physics at the University of Wisconsin. It's in the range of 5 to 10 percent, he says. The utility is getting government bailouts, money that is helping to pay for cleanup at the plant. But that's just a start. "The most difficult challenge that they face is to decontaminate the area that is currently being evacuated so that people can go back to their homes," says Jacopo Buongiorno, a professor of nuclear science and engineering at MIT. "So I'd say their biggest challenge is going to be offsite." That involves hosing down roads and buildings to wash contamination into the dirt. And it also involves scraping up huge volumes of soil. It's not clear what it will take to bring radiation levels back down to the local residents' comfort zone. And this isn't simply a technical question; it's a judgment call, ultimately left to people who have been through a lot over the past 12 months.